Lori La Bey, host of Alzheimer’s Speaks Radio talks with Linda Burhan’s, is known as the Caregivers Caregiver. She is an author, speaker on caregiver advocacy. 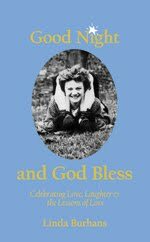 Her book, Good Night and God Bless, is a heartfelt story about the joy and challenges about caring for a parent. Linda has facilitated over 1500 support groups and workshops for caregivers where she shares lessons learned and coping tools with caregivers She also has a blog and radio show.